A Bike Tourism Riddle: What does it mean when the car-free weekend at Crater Lake National Park gets hit by an icy storm that, at best, makes the cycling highly unpleasant and, at worst, makes it downright treacherous – and, yet, hundreds of people still flock to the park with their bikes? When we arrived at Crater Lake on Saturday afternoon, the ranger at the entrance gate asked if we were there to bicycle around the rim. She looked nervous for us, so I jokingly asked if it had snowed yet. Yes, she said, they had gotten some snow that morning. But the forecast is supposed to be a lot better on Sunday, she added hopefully. We paid our entry fee and she wished us luck. For years, there have been high-level conversations between bike advocates and park management about closing the rim road to cars for a short period of time and opening it only to people on foot or bike. In June, park management finally agreed, and it turned out to be one of their highest grossing weekends ever. That paved the way to make it an annual event – the third weekend of September – and we instantly made travel plans when we heard the news! The trouble with the third weekend in September is that, at 7200 feet, the weather can be just about anything. This past weekend, the weather decided to be stunningly cold and craptacular. At noon on Sunday, the rim was socked in with a freezing fog so thick that you couldn’t see the water from the edge. Visibility was maybe 15 feet and plants on the hillside were covered in ice. Suffice it to say that we never actually rode our bikes. Instead, we hung out with the 15 or so friends who had also made the 5-hour trek from Portland. We camped out, despite the awful weather, and ate at one of the restaurants in the park. And we marveled at the incredible number of bikes we saw strapped to incoming cars. To be honest, we were worried that the weather would scare everyone away and that, if nobody showed up with bikes, an incredible opportunity would be lost. Without a doubt, the weather did scare some people away, but it was also quite clear how eager folks are to experience riding a bike at Crater Lake without the noise or stress of sharing the road with cars. 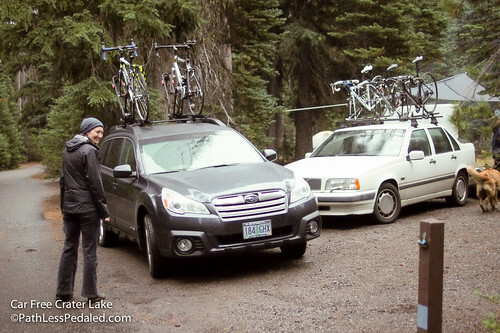 Put another way, even if nobody actually rode a bicycle through the wintry weather on the rim road, hundreds of people showed up (and spent money) at Crater Lake over the weekend simply because the park promised the opportunity to ride without cars. Despite the weather, we think this weekend was a bike tourism success, and we encourage Crater Lake National Park to continue their commitment to an annual car-free weekend. 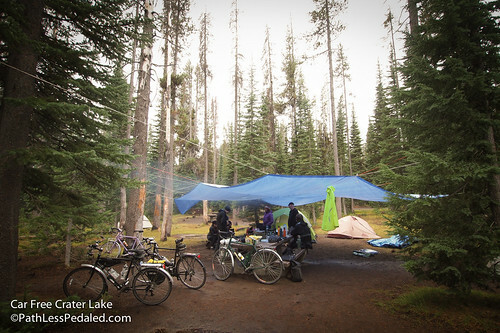 Beyond just Crater Lake, though, this weekend has important applications to bike tourism efforts worldwide. Bike tourism doesn’t need to be complicated and it doesn’t necessarily need to be all about the bike. Oftentimes, people on bikes feel like they’re inserting themselves someplace where they’re not particularly wanted. As soon as you create a space where people on bikes feel welcome, they’ll be there, even if they can’t actually ride their bikes, and they’ll be loyal. Bike tourism is also one of the few real-world instances where, if you build it, they will come. In the case of Crater Lake, building ‘it’ was as simple as closing a few gates and keeping an existing road open to bikes only. “Bike tourism is also one of the few real-world instances where, if you build it, they will come.” … Hmmm. Be careful about over-selling. The Crater Lake car-free weekend indicates that if you have a spectacular national park with a 33 mile loop road full of outrageously gorgeous views and you turn it into a wonderful car-free bike path — they will come. Brian – True, Crater Lake definitely has an advantage, and it’s entirely possible that people were willing to brave the awful weather because it’s such an incredible bucket-list sort of place. But we’ve seen the same “if you build it, they will come” phenomenon in far-less-scenic places, in part because folks are hungry for welcoming places to ride. I applaud your efforts on all fronts! This is such a simple, good idea! I live in GA and now I’m looking at my calendar to see how I can work in a trip to Oregon! There’s a rail-to-trail just west of Atlanta called the Silver Comet Trail that goes 60 miles to the state line. You guys can really do a lot for the few rural towns along this route who can benefit from bike tourism. I’m really glad that they’re doing this (the car-free weekend, that is.) But more glad that I got to ride around it in July, when it was sunny and pushing 70F. Yes, there were cars, but it still was fun. I keep asking if a car free weekend could be possible for RMNP. It would not have to be the complete Trail Ridge Road. 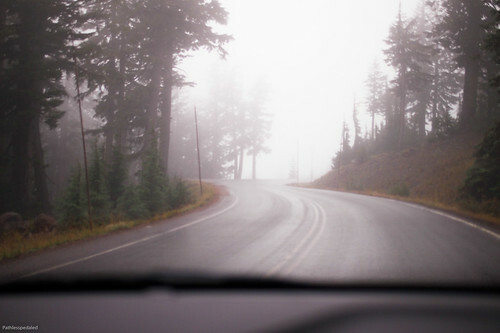 Maybe Bear Lake Road. I know that the front range of Colorado would flock up here if people knew they could have a day without competing with cars. Just so everyone knows in winter the crater loop is car free every day and is a beautiful place for back country skiing. Bikes are great, skis are even better. I did it in early September and it was spectacular. One of the most fun things I have done. We flew to Portland and had found a bike rental outfit for a two day rental. Cars were not a bother at all as there were very few of them. Temp was lo 30’s to start but warmed up. Strange to see a picture with 2 cars, and a sign carfree craterlake. For me from the Netherlands, Carfree means without a car. So if you go there on your bicycle that is carfree. Yes, the irony of this car-free event is that it is located so far away from everything that it’s not a viable option for most people to cycle there and back. The shortest way to get to Crater Lake from Portland without a car involves a five-hour train trip (arriving into Klamath Falls late at night, thus requiring an overnight stay) and a 70-mile bike ride. Great description. Planning to do it next year or after. Where in Portland, did you rent the bikes? Thx.